With Bethenny Frankel and Jeff Lewis as guests, Andy Cohen didn’t have to make too much effort to host Watch What Happens Live last night. These two never have a problem opening up and spilling the tea, especially after the conclusion of Real Housewives of New York’s Mexico trip. Bethenny and Jeff had a lot to say…. as per usual. I never expected to see Alex McCord back on Bravo, but I was so there for her resurgence on Watch What Happens Live last week. I feel like absence made the heart grow fonder because I didn’t even realize I missed her. Now everyone wants to know what Alex thinks of her former Real Housewives of New York costars now that she’s had some time away from the crew. After all, she and Simon van Kempen are still together after many seasons of criticism from the cast and viewers while Bethenny Frankel and Ramona Singer have gone through some pretty public divorces. Alex McCord is a name I haven’t heard in forever, but she made a random return to Watch What Happens Live and America. Not only that, but Ramona Singer was in the club house as well. It was a combination I never expected to see, but I was here for it. I’m not really sure why Alex did this appearance since it’s clear that she wants nothing to do with the reality TV life, but the dynamic between her and Ramona was pretty interesting to watch. Stassi Schroeder‘s latest podcast covers issues far and wide in the realms of reality TV – from how villains save reality TV, to Real Housewives, to how The Bachelor has changed. But the Vanderpump Rules star also discusses her dream funeral, high-stakes Instagram negotiation, and why she’s obsessed with Asian women. Below are some of the highlights (I use that term loosely). Stassi’s guest is her friend, comedian Annabelle DeSisto. Honestly, almost every topic on the show came back to death of some sort, which is strange. First, “DJ James f–king Kennedy, the human scrotum” is the latest thing making Stassi contemplate suicide, because it is super unfair he could inherit money from George Michael. She texted everyone a pic a cult’s mass suicide, because if James gets any money, they’re going to want to kill themselves. Happy Monday! It’s a short work week for many of you, so there’s something to be a little happy about on this Monday morning, right? To get you through the day we have a new photo roundup of our favorite reality stars out and about this weekend. 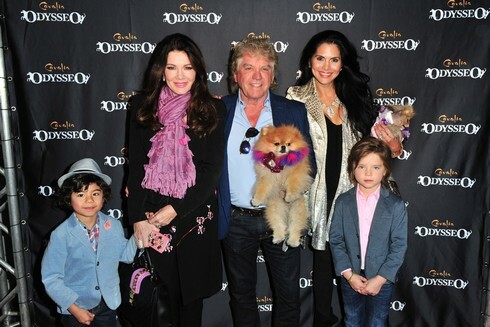 Above: Lisa Vanderpump and Joyce Giraud took her boys (and Ken and Giggy) to the premiere event of ‘Odysseo By Cavalia’ this weekend. Real Housewives of Orange County‘s Shannon Beador and her family were spotted there, too! And many other past and present reality TV stars: Courtney Stodden, Kate Gosselin, Former Ladies of London star Annabelle Neilson, Jacqueline Laurita and more!